So we made it to Friday again and the one thing that keeps rolling around my mind is, “where the heck have I been for the last decade?!!”. I mean, how could I be a living and breathing, fairly well-connected person (or so I thought) and a food blogger and not know about the wonder of chocolate chip cookie brittle?!! Because it is a wonder. Undeniably. And for so many reasons. As is the terrific new cookbook from Food 52’s Kristen Miglore, Genius Desserts. Have you had a chance to take a look at it yet? For answers to these and more mysteries of the universe, read on. 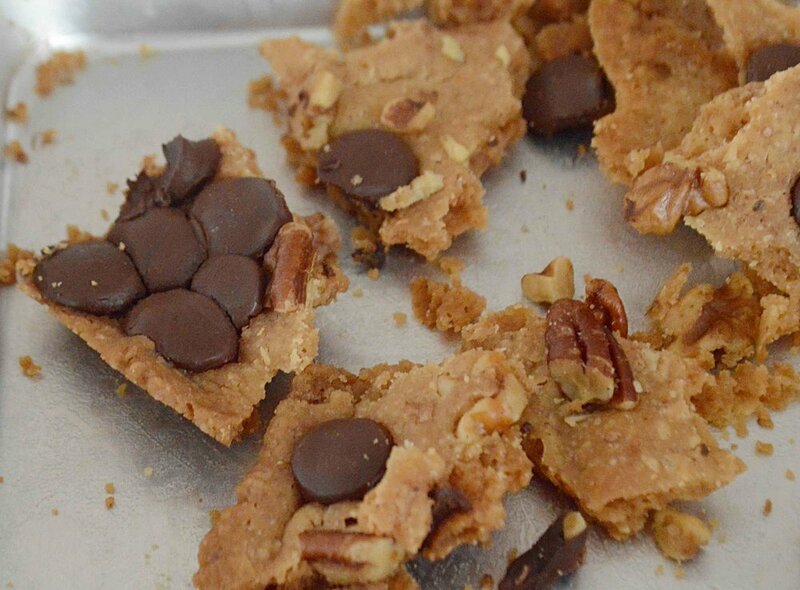 And if you’re not into my nonsense today, simply scroll down to the recipe because this brittle is a must-make!!!!! Apparently, chocolate chip cookie brittle has been “a thing” since Shauna Sever (aka The Next Door Baker) first published it on her site in 2009 after finding it in a bed and breakfast cookbook. Since then it has had millions of hits, especially after she demoed it on The Today Show. Where was I when all this was happening? Happy in the land of oblivion I guess, although I couldn’t have been too happy, not having yet known the magic of this brittle. Ha! Now, I’ll get to why this confection is so winning and why you can probably make it tonight without a trip to the market, but first I need to wax poetic about the aptly named, Genius Desserts: 100 Recipes That Will Change The Way You Bake. Many of these recipes are culinary game changers that I’ve loved and made for years, like Maida Heatters Skinny Peanut Wafers, Alice Medrich’s Cocoa Brownies and Dorie Greenspan’s World Peace Cookies. But there are other hidden gems that I haven’t heard of like Peach Cobbler with Hot Sugar Crust (I’m currently trying it out RIGHT NOW with apples instead since peach season has long passed but I cannot wait until next summer to test this as out as I’m thinking how amazing it would be for Thanksgiving if all turns out well—will definitely keep you posted. ), Ten Minute Lime Cracker Pie, Brazilian Carrot Cake, Erna’s Lace Cookies and so many more that I know you will love and will forever change your baking repertoire. The book is also filled with gorgeous color photos and the recipes are down-to-earth and simply written, a la Food 52-style. It’s a cookbook that will make you just want to stay home and bake, which is not an entirely bad thing as we head into colder weather, as long as you can spend some extra time at the gym too!! Now onto this one-bowl, no-mixer-required chocolate chip cookie brittle!! At last!! Truly, it comes together in just a matter of minutes. Once you mix the dough together, you simply press it with your fingers into a rimmed baking sheet and bake. Less than 30 minutes later, it emerges and now comes the hard part. You have to wait until it’s completely cooled to break it up into pieces or risk smudging the chocolate. But that gives you time to do a workout and offset the nibbling that is about to ensue! Every bite is crunchy, golden, buttery, slightly salty, chocolate-y, nutty, goodness!! Sort of a cookie, sort of a candy and addictively yummy! It would be just the treat to bring to someone’s house for football watching or to up coming holiday parties or even to wrap up in a little tin or jar and give as a gift. Just make sure to keep a few delightful shards for yourself! 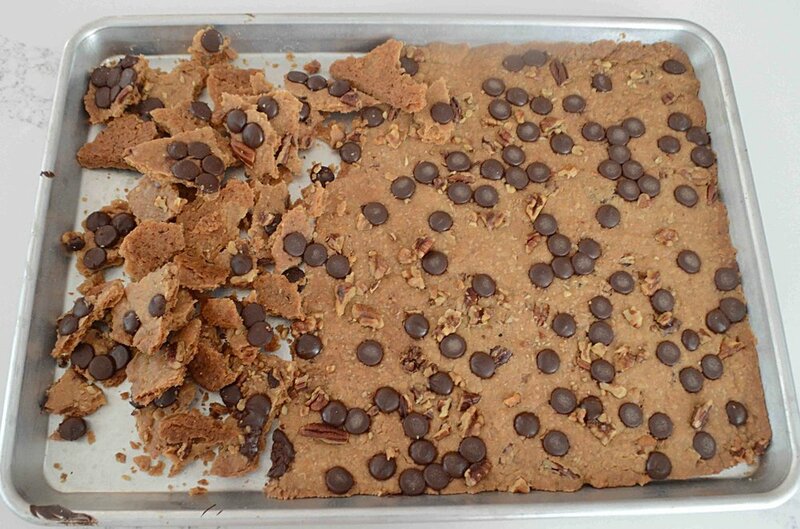 Ok, so now that we all know we’re making brittle this weekend, what else are your plans? Not sure what’s on the agenda for us. Hear we might be getting some cold rainy weather (perhaps it’s a sign that I should try another treat from Genius Desserts?) In any case, whatever you do, have a happy, safe and fun weekend and I’ll be back next week as we brave Halloween and hurtle into November!! 1. Preheat oven to 350ºF and make sure rack is in the center. 3. Use a whisk to mix the butter and sugar together really well and then let cool for 5 minutes. Then whisk well for 1 minute so that mixture is no longer separated and is thick and smooth. Whisk in vanilla and salt. Use a large spoon to add in flour until no traces of it remain and then add in 1/2 of the nuts and stir well to mix. 4. Transfer the dough to a rimmed 12x17-inch ungreased baking pan (a half sheet pan) and use your hands to pat it into a thin even layer. It will seem like there is not enough dough but just be patient and spread it out and it will work. Sprinkle the chips and remaining nuts all across the top evenly and press down on them a bit so that they stick into the dough. 5. Bake for 22-25 minutes, rotating the pan every 7 minutes, until the dough is golden brown and slightly firm to the touch. Transfer to a cooling rack and let cool completely. Then break into pieces, trying not to smudge the chips and eat it all. Store at room temperature in an airtight container for up to one week. Note: Recipe adapted from Food 52 Genius Desserts by Kristen Miglore via Shauna Sever.